As I have mentioned before, I am a huge fan of fan theories! Obviously most don’t pan out, but it is just fun to hypothesize. I love over analyzing the backgrounds of scenes and pausing and rewinding movie trailers to watch over and over again until my overactive imagination pretends to see things that aren’t even there. For this Fan Theory Friday, we are going explore if the Marvel Cinematic Universe’s Hawkeye Is Actually A Skrull? WARNING OBVIOUS SPOILERS AHEAD FOR VARIOUS MARVEL MOVIES. The Skrulls are a shape-shifting, war mongering alien species that have been attempting to take over Earth in the Marvel comic books for years. They will be making their first on screen appearance in March with the release of Captain Marvel. I still believe we will see a Dr. Strange/Nick Fury post credit scene in Captain Marvel. Many rumors have the Skrulls becoming the new main antagonist in the next phase of the Marvel cinematic universe, leading up to a grand “Secret Invasion” storyline climax. Similar to how Thanos was built up during the first 3 phases of the Marvel movies that led up to Avengers: Endgame. In the Marvel comic book cross-over “Secret Invasion,” many of Earth’s super-heroes had been kidnapped and replaced with shape shifting Skrulls. These Skrulls have the ability to replicate the heroes looks, powers and memories making them nearly undetectable. But have we already been introduced to a shape-shifting Skrull in the Marvel cinematic universe? Remember Loki’s reaction when he touched his scepter to Clint Barton’s (AKA Hawkeye) chest at the beginning of the first Avengers movie? If you don’t, here it is. It is almost as if Loki is surprised by what he sees. Since this is the first time we see Loki use the staff, it is possible that even he wasn’t quite sure what to expect when he touched the staff to a human being. Or could it be that he saw that Clint was more than a regular human? Such as a Skrull? And how is it that Clint inherently knew so much about the tesseract? When I initially saw this in Avengers, I assumed they were simply trying to build up the depth of Hawkeye’s character. Implying that he is a skilled tactician and logical thinker on top of his skills with a bow. Or is it that, as a Skrull, he was already familiar with the concept of a larger universe with various worlds/dimensions/realms. For the record, I’m not sold on this fan theory. While I love the idea that Marvel has such long a term strategy in place that they may have been planting the seeds of a “Secret Invasion” storyline as far back as the first Avengers movie, I don’t think we would have seen so much of the screen time of Avengers: Age of Ultron devoted towards Hawkeye’s family and his relationship with them if he was going to be revealed as a Skrull. One was to appease the actor (Jeremy Renner) who was disappointed (and rightfully so) that his character spent much of the first movie as a zombie. The other (and this is pure speculation on my part) to allow the audience to empathize with Clint after his family was wiped out in the decimation of Avengers:Infinity War. 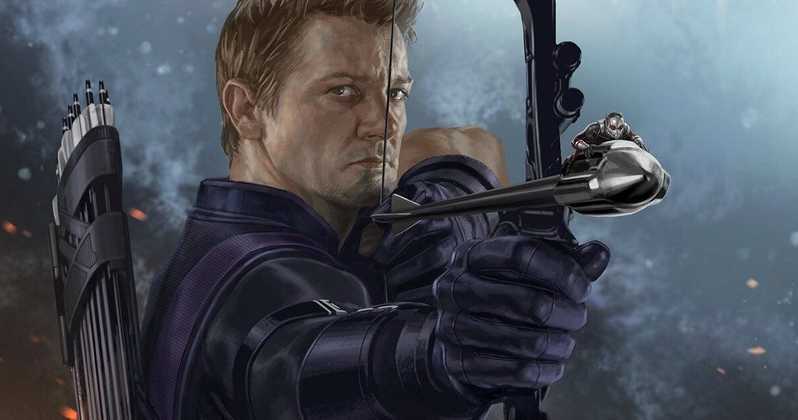 After seeing what Clint has lost, we can closer relate to his fall from the wise cracking optimists Hawkeye to the dark vengeful Ronin we see in the Avengers: Endgame trailer. What do you think? Is there any validity to this fan theory? Or do you think this theory is simply a shot in the dark? Next Zoo Will Feed Meerkats A Cockroach Named After Your Ex Live On Valentine’s Day! If this theory is true – I’d expect that they retcon Hawkeye as a Skrull. In other words – no way they planned this from the get go.